The librarians didn’t come for the muffins. But the publishers came for the librarians. The librarians didn’t come for the muffins. But the publishers came for the librarians. And even if, during the Q&A, the publishers bolted out the door like hunters rushing to the other side of the isle with spears and a renewed lust for prancing porcine, moderator Nora Rawlinson handled the panel with a deft hand, squeezing three librarians and a Harper Collins library marketing rep into the fifty fresh minutes. It almost demanded another twenty. Libraries are often forgotten when considering the brick and mortar part of publishing. But it became very clear during the talk that, with 9,000 library systems across America, libraries are robust places to discover and share books. Of those 9,000 systems, a good thousand have four or more branches. And according to Rawlinson, when libraries survey their public, libraries translate into books. They are places to promote books, but they are different from bookstores. 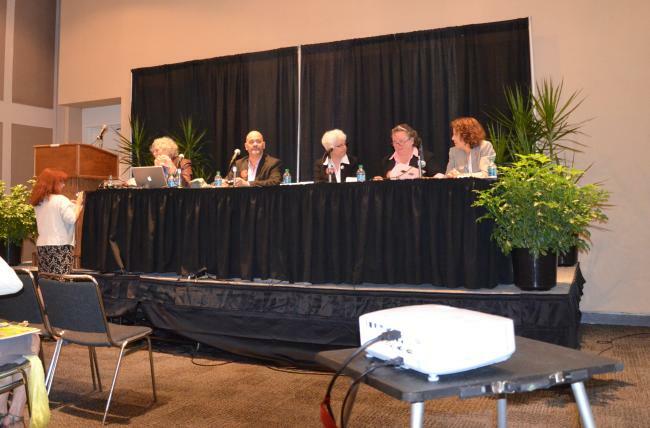 “Libraries can’t do the stack ’em high, watch ’em fly,” said Rawlinson at the panel’s start. But the big difference is that when a library accumulates tomes, they’re guaranteed to go out to the public. Libraries continue to promote specific titles on their websites. And as Michael Colford, Director of Library Services for the Boston Public Library, pointed out, the Boston Public Library website received eight million hits on its website last year. One way that Cuyahoga County has rehabilitated its library system in recent years is through an initiative called Reconnect with Reading. Noted independent booster Nancy Pearl came in and “infused her positive energy” into Cuyahoga. Over the course of a year, Pearl spent one week out of every month getting people to think about what they love to read and rethinking systems on how to connect customers to the reading experience. This included digital billboard ads, Google ads, bus ads, and considerable awareness. But this awareness has translated into library patrons “knowing us for the authors we bring.” Feldman revealed that there were often hundreds in attendance for a debut author. And, equally interesting, Cuyahoga has used Facebook to woo readers, with librarians leading an online book discussion and suggesting three new books to read if the patron fesses three recent volumes. Lynn Wheeler, director of the smaller Carroll County Public Library, revealed more impressive results. Carroll County is a six branch system. Yet despite serving a population of 170,000, it was able to bankroll 6,330 programs during the 2011 fiscal year. The library once purchased 73 copies of Kate Alcott’s The Dressmaker for its branches and, because the library displayed the book in all of its branches, it ended up stocking 433 copies. And because there was so much excitement for the book, local historical reenactors were tapped. And through the simple act of pitting one book against another — an idea borrowed from neighboring Howard County — and encouraging schoolkids to vote on the book, Carroll County was able to get numerous children excited about books. In this “Battle of the Books,” the books in question were given to competing schools. There were 72,000 votes involved. Kids became experts on the books in knowledge bowl-style quizzes. (The accompanying photos during Wheeler’s presentation revealed a Little League-like excitement on the kids’ faces.) An all-boy team won. By the time that Virginia Stanley, director of Library Marketing for Harper Collins, spoke, there was little time left in the panel. So Stanley didn’t get much to say, despite wearing a tiara telegraphing a Queen Victoria-like fickleness. She did say that she was trying to accommodate libraries by getting authors to “appear” via Skype. But given the hearty discussion about how physical space and community produced serious results for libraries big and small, why should publishers and libraries settle for anything less than face-to-face?